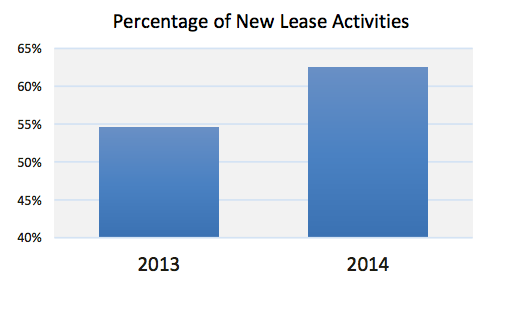 2014 was another strong year for Manhattan office space as rents rose across markets and building classes. In Q4, the Manhattan-wide average effective rent increased by $1.94 to reach $58.63 PSF bringing the YOY change in average effective rent to $5.81 PSF. Class A space grew for the quarter, rising by $0.69 to close at $64.44 PSF. Meanwhile, average rent for class B space rose to $52.48 increasing more than $5 PSF in Q4. Absent an additional push from the high-end market, class A average effective rent ended the year in the high $60s PSF. On the other hand class B properties provided a much stronger showing; their average effective rent rose $3.57 to $54.00 PSF. 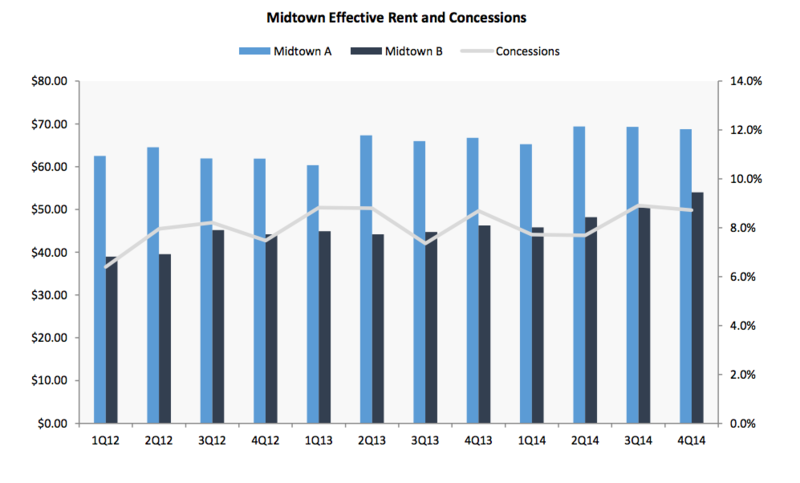 In Q4 the relative convergence between rents in Midtown South and Midtown has forced landlords in the latter to continue to offer generous concessions packages of over 8% of total lease consideration. Including some prominent deals, like MUFG Union Bank’s 200K+ SQFT lease at the McGrawHill Building, new leases composed over 60% of the market’s total leased square footage in Q4. This number tracked the market’s 2014 average, suggesting that rent growth was supported by robust macroeconomic growth. 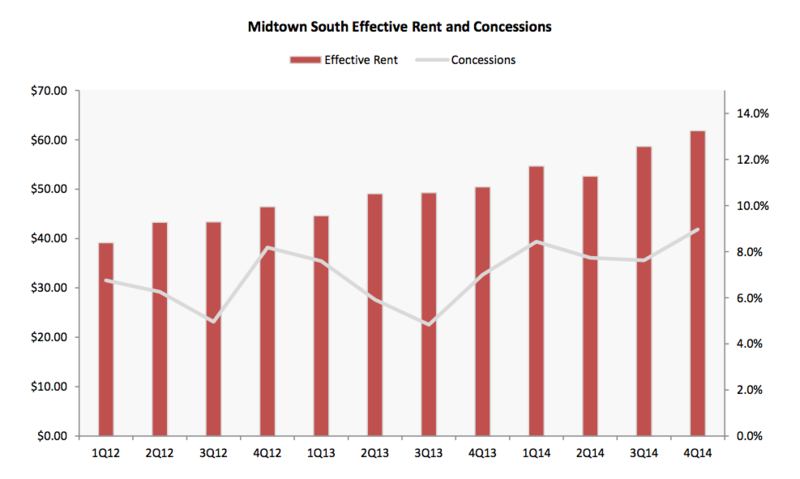 Midtown South’s strong year has left the market frothy going into 2015. The average effective rent for the quarter has increased by $3.19 to reach $61.85 PSF, over 20% higher than the same period in 2013. This trend was driven by high-end transactions in the NoHo submarket, including seven different deals signed at over $100 PSF. Among this elite group of leases were Anchorage Advisors’ renewal at 610 Broadway and Tudor Investment Corporation’s new lease at 51 Astor Place. BuzzFeed’s near 200K SQFT lease at 225 Park Avenue South was just one of the many reasons new leasing activity comprised over 80% of the quarter’s leased square footage. Meanwhile, concessions packages grew to about 9% this quarter indicating that all-time highs in rental prices have also led to juicier concession deals. Downtown experienced moderate growth in Q4 as the market’s average effective rent settled at above $40 PSF, corresponding to approximately 8% YOY growth. The World Trade Center submarket has seen double-digit YOY growth in its average effective rent driven by an outpour of class A deals, such as High 5 Games and xAd’s new leases at 1 WTC. 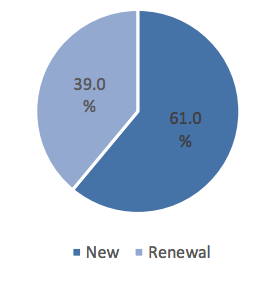 On the other hand, the Financial District struggled this year, remaining stagnant around $35 PSF at the end of 2014. 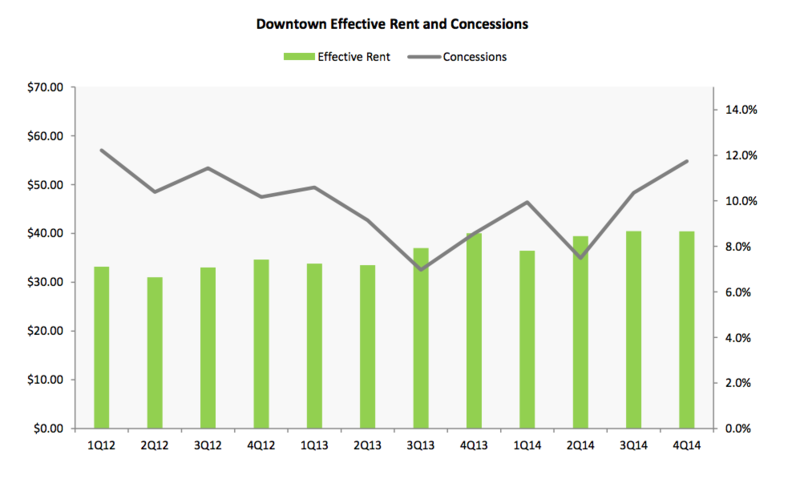 Absent the large relocations seen earlier in the year, new leasing activity accounted for a smaller percentage, 77.8%, of Downtown’s transaction volume in Q4. Part of this frenzy of new leases may have been driven by a continued increase in concessions as landlords worked hard to lure tenants to the market. 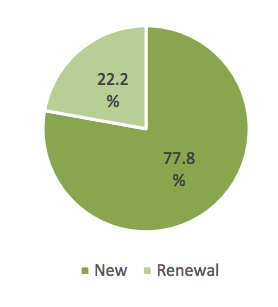 In Q4 the average concession package grew to over 11% of the total lease value. New deals accounted for over 60% of Manhattan’s transaction volume in 2014 as businesses grew more confident and leased new space. Some notable leases from this boom include the embattled Sony's 500K+ SQFT lease at 11 Madison Avenue and white-shoe law firm White & Case's 400K+ SQFT relocation to 1221 Avenue of the Americas. In general, both class A and B sectors performed well in 2014, average class A effective rent reached $60 PSF while class B surpassed the $45 PSF mark. The biggest beneficiary of 2014’s spurt in business confidence was Midtown South. The market’s booming rents recorded the third consecutive double digit YOY growth rate in effective rent, rising to over $60 PSF at the end of the year. This growth kicked off two trends that may have a significant impact on the market in 2015: increased tenant migration and a stronger class B rental market. Overwhelming rent increases have unleashed a wave of tenant migration as companies searched for more affordable, but still accessible, space. TAMI tenants, traditional denizens of Midtown South, have been shaken by this trend as more and more of them move Downtown. 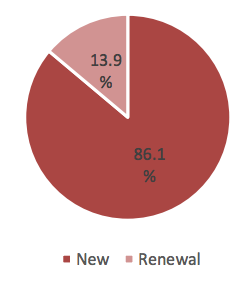 Tenants from this group comprised over 40% of the leased spaces in the market in 2014. The most notable leases of the bunch are Time Inc’s 600K SQFT lease at 225 Liberty Street and Hudson’s Bay Company’s lease at Brookfield Place. 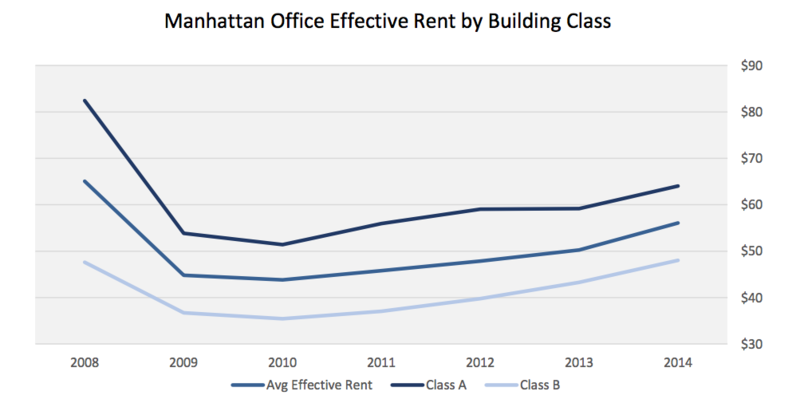 Class B rents have also seen a boost from the convergence in cost between Midtown and Midtown South prime real estate. With Midtown South’s class B rents growing at a faster-thanmarket pace Midtown’s class B properties have become more attractive to lessees. This increased demand has pushed Midtown’s class B average effective rent to over $50 PSF in Q4. Penn Station and Times Square South, submarkets with a large class B inventory, both posted double-digit YOY growth in average effective rent. About: The Effective Rent Report is produced by CompStak, Inc. For comments or questions, please contact Wei Chen Yu: Wayne@CompStak.com or Noam Shahar: Noam@Compstak.com. CompStak Exchange</a href> is a free platform for CRE brokers, appraisers and researchers to exchange verified commercial lease comps anonymously. CompStak Enterprise</a href> offers unlimited fee-based access to comp information to CRE landlords, lenders and investors. The information contained in this report was gathered from CompStak users and other sources that we consider reliable. While we strive for perfection, this report may contain errors or omissions and is presented without any warranty or representations as to its accuracy. *Effective Rent takes into consideration the rent paid for every year of the lease, as well as landlord concessions such as free months and tenant improvement allowance.